Therapeutic Recreation is a holistic process that purposively uses recreation and leisure activities to bring about a positive change, either socially, mentally, intellectually, physically, and spiritually in an effort to maintain and improve quality of life. Therapeutic Recreation to me is one of many ways to help a person overcome some sort of challenge. The unique thing about therapeutic recreation is that it does not focus on one form of treatment but allows recreation therapists to implement programs that are specific to a client’s needs using a variety of activities. 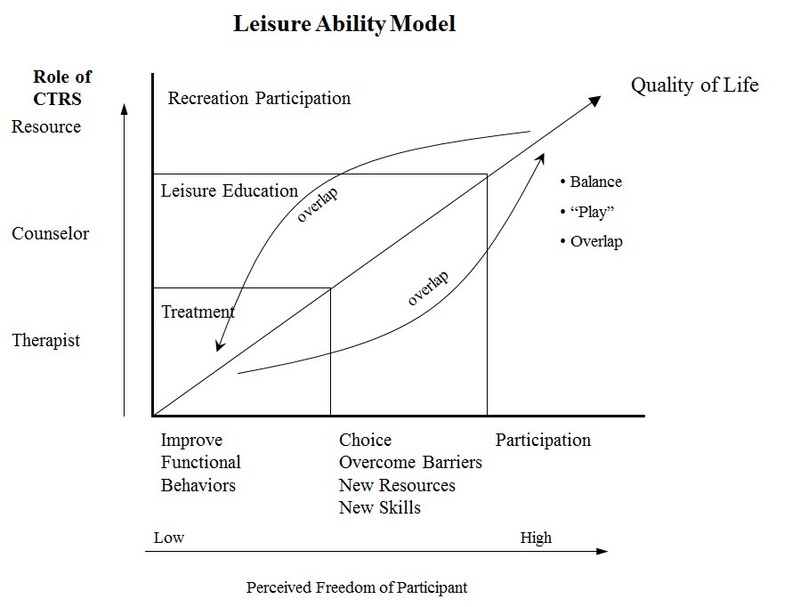 The Leisure Ability Model demonstrates how a CTRS uses treatment, leisure education, and recreation participation to help a participant move from complete dependency of a CTRS to a greater amount of perceived freedom when it comes to their own treatment. TR is a flexible form of treatment that allows a participant to receive the necessary attention according to their needs in whatever stage of their treatment they might be in. As a (future) CTRS I believe that the greatest part of TR is that it is person-centered. Caring for a person is no small task, but when done with the right training, sincerity, and direct focus on the participant then TR becomes an innovative and unique modality that can help any population with any challenge they are trying to overcome. The Leisure Ability Model is ideal because of how the roles of the CTRS and the client shift as the client progresses. If a client is in the beginning stages of therapy they will be much more dependent on the CTRS and rely on them for treatment. For example, a client who recently suffered a spinal cord injury won’t be ready to play on a wheelchair rugby team quite yet, but the CTRS will work with the client following this model to help the client have a better quality of life. The CTRS will help the client in dealing with the secondary traumas the client might be experiencing as a result of their injury. The client might be experiencing depression, low self-efficacy, and lacking motivation or hope for the future. The CTRS would treat the client through a variety of tasks, experiential learning, and positive outlooks on life. At the same time the CTRS will instruct how the client can continue to be active through a variety of activities and sports such wheelchair rugby, basketball, adaptive skiing, and so much more. Offering opportunities to learn and be engaged will improve the client’s quality of life as they see that they can still be active and find greater meaning in life, even if they have suffered a change in lifestyle. Part of a person’s treatment is experiential learning, which is where recreation fits in so well. The client might not respond to an office therapist trying to help them with their depression, but if the client is able to learn to live independently and find something they can identify with, their depression will be naturally treated. Rather than the client identifying himself as a person with a spinal cord injury, they can identify themselves as a basketball player, or a rugby player, something in which they find fulfilment in life. Recreation is a modality that can treat a client’s symptoms, teach them how to adapt to their new lifestyle, and engage them in ways that will holistically provide a greater quality of life. As the CTRS successfully helps the client through the Leisure Ability Model, the client becomes more independent and the CTRS become more of a resource rather than a therapist. The goal of the CTRS is to help the client become independent and continue with their treatment programs on their own, being able to find more things to become involved with and becoming the captain of their own life.